Dermatitis is a general term used to describe a group of conditions in which the skin becomes chronically itchy and inflamed. There are two predominant types that occur in dogs and cats, atopic dermatitis, when exposure to an environmental allergen results in an inflammatory response, and contact dermatitis, in which affected animals experience a reaction to inhaled or contacted environmental allergens. Although both forms of dermatitis are the result of an allergic reaction to a skin irritant and are often grouped together, it is important to recognise that they are two distinct diseases and need to be diagnosed and treated accordingly. 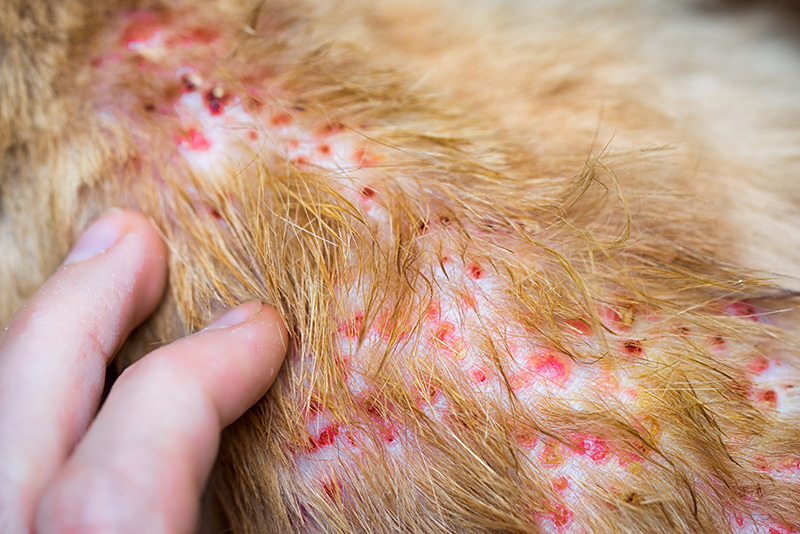 This is the most common type of dermatitis in dogs and cats, occurring when exposure to an environmental allergen results in an inflammatory response (the over-production of antibodies by the immune system) that affects the skin. It is a pruritic disease, meaning that it causes extreme itchiness and provokes the urge to scratch. Atopic dermatitis in dogs and cats can develop in response to normally harmless substances like grass, mould spores, house dust mites, and other environmental allergens. The substance may not have previously caused any obvious problems. Sensitivity to the substance can develop slowly over time and then come on suddenly without warning. Most allergic reactions require a period of repeated exposure and skin sensitisation, which can take anywhere from 6 months to 2 years to develop. Dogs are more prone to this condition than cats. Dogs generally show signs of the condition between 3 months and 6 years of age, though these can be so mild during the first year or so that they do not become clinically apparent before the dog’s third year. Feline atopic dermatitis is similar to that of dogs. The age of onset in cats is variable, but is generally under 5 years. 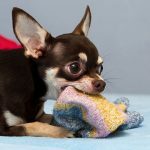 The most commonly affected areas in both dogs and cats are the ears, wrists, ankles, muzzle, underarms, groin, around the eyes and between the toes. To learn more about skin allergies in dogs, you will find this article helpful. If you are concerned about hair loss, you may also find this article informative. Contact dermatitis occurs when actual physical contact is made with a chemical or other irritating substance, causing an inflammatory response in the body (the over-production of antibodies by the immune system) that affects the skin. This occurs far less frequently than atopic dermatitis in both dogs and cats. Contact dermatitis does not require a period of sensitisation; in fact, the animal will most likely experience a reaction the first time they come in contact with the irritant. While atopic dermatitis is widespread and affects most of the body, contact dermatitis typically affects the areas that are less protected by hair, including the feet, nose, chin, lips, jointed areas (‘knees’) and the underside of the abdomen. In addition, ulcers may occur in cases of contact dermatitis. Dermatitis is typically associated with redness, swelling, skin lesions, blisters and/or rashes of the skin. The resulting discomfort will usually result in your dog or cat licking, biting, or scratching excessively at the affected area, which can lead to a secondary bacterial infection. Often the symptoms of atopic dermatitis progressively worsen with time and increased age, and become more severe during certain seasons. Signs of being an allergy sufferer such as profuse wheezing, sniffing, breathing difficulties, watery eyes or skin problems. Petroleum-based substances such as fertilisers, perfumes and petroleum jelly. Animal danders (skin flakes, dandruff). Early onset is often associated with a family history of skin allergies. 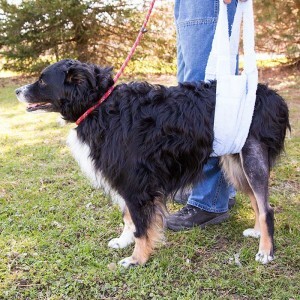 This may lead the dog or cat to become more susceptible to allergens. There appears to be a genetic predisposition (inherited genes passed down through generations) for atopic dermatitis in certain dog breeds, but the prevalence within a breed largely depends on the genetic pool and region. Purebred cats may have a higher risk than domestic shorthaired cats. How is dermatitis in dogs and cats diagnosed? Your veterinarian will take a comprehensive medical history and conduct a complete dermatologic and physical examination of the animal so as to determine the specific type of dog or cat dermatitis and identify its underlying cause. Unfortunately, there are no tests that can definitively diagnose atopic dermatitis in dogs and cats. However, tests can be performed to differentiate the condition from other diseases with similar clinical signs, such as flea allergy, mosquito bite hypersensitivity, food allergy, autoimmune disease and parasites. The diagnosis of atopic dermatitis is made when the differential diagnoses have been eliminated. Formulate specific immunotherapy that targets the offending allergen. Atopic dermatitis is a chronic, life-long problem that requires ongoing management and treatment and regular progress checks. 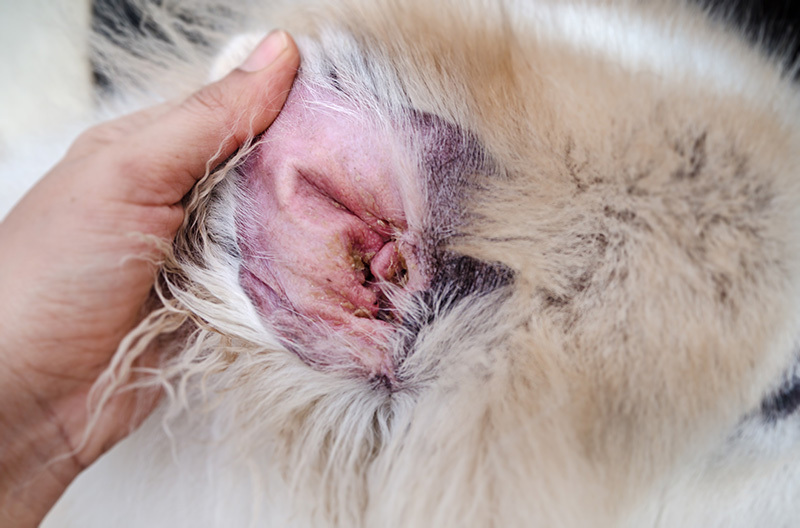 Over time or without treatment, atopic dermatitis usually gets worse, resulting in excessive licking, biting or scratching that can lead to hair loss, secondary bacterial skin infections and ear infections. This will have an increasingly negative effect on the animal’s quality of life and personality. However, if the signs are recognised and the allergens identified early on, the condition can be effectively managed, and the animal’s comfort and well-being can be greatly improved. Resolution of dermatitis requires identification of the underlying cause and treatment of secondary infections or other complications. The vet will advise how to best avoid the trigger allergens. This may be the best option, but can only be accomplished if a specific allergen has been identified. Allergen-specific immunotherapy (ASIT) may be performed (see box below). Immunosuppressant medication may be effective in controlling itching associated with long-term skin allergies. Anti-itching sprays can be used over large body surfaces to control itching with minimal side effects. Antihistamines may be prescribed to control or reduce itching. Oral steroids may be prescribed for acute flare-ups with pruritus (itching) that is severe or too extensive to be controlled with topical formulations. Bathing the animal routinely in cool water with anti-itch and/or antimicrobial shampoos may help alleviate symptoms. Maintaining regular check-ups with the vet is the most important preventative measure that can be taken. 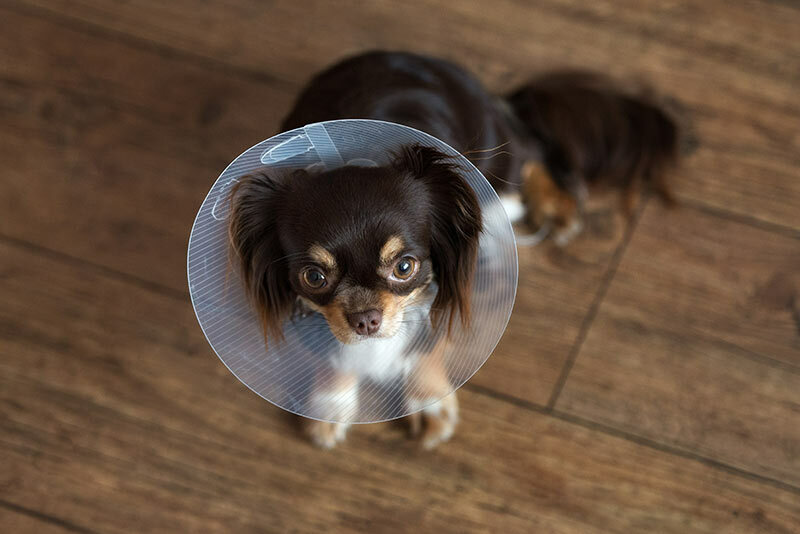 If the animal is prone to biting or scratching, a cone (Elizabethan collar) or other alternative is recommended; this will also prevent ingestion of any topical treatments. Provide toys that are rubber-free. The vet may prescribe anti-inflammatory treatments, such as topical or oral corticosteroids or antihistamines, to control the itching and other side-effects associated with the allergen. There are also medicated shampoos and sprays that can provide temporary relief from itching. Dermatitis is a common skin allergy in dogs, also occurring, although less frequently, in cats. Atopic dermatitis is a chronic, inflammatory skin disease associated with allergies to particular substances. The animal develops a hypersensitivity to the trigger allergen slowly, by repeated exposure over time. Common allergens include airborne pollens, mould spores, house dust mite, soaps, detergents and shampoos. These cause symptoms such as intense itchiness, excessive scratching, hair loss and inflamed sores to the skin of various parts of the body. Contact dermatitis is a relatively rare skin disease that can occur when a dog or cat makes physical contact with a chemical or other irritating substance that causes an instantaneous adverse reaction. The treatment recommended by the vet will depend on the cause of the dog or cat dermatitis and may include medications to relieve itchiness and other symptoms, avoidance of the allergen (if possible) and immunotherapy to desensitise the animal to the allergen. Typically, dermatitis can be managed but not cured, and ongoing veterinary consultations are required.